Rich Panda slot has a Chinese theme and is a 1024-way slot over 5 reels and 4 rows. It has gentle oriental music to sooth you during play and you'll see typical Chinese symbols such as the Panda, Cats and Lotus Flowers. 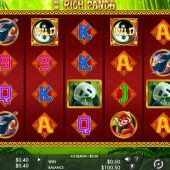 At first glance it could be mistaken with several other Panda-inspired slots, such as Aristocrat's Wild Panda or Playtech's Lucky Panda. You will see card symbols which are stacked in various amounts of either 1, 2 or 3 rows high. The Chinese symbols are either single or double - stacked but it is possible to get 3 in view on some reels with a double and single appearing. The Panda naturally pays the best for 5-of-a-kind at 7.5x stake down to the lowest 9 which pays 2.5x stake. The awards aren't high but like many 1024-way slots you can achieve multiple ways of them in any one spin. Ying and Yang are the Wild symbol appearing singly on the middle 3 reels and no multipliers are attached. Pink Lotus Flowers are present on all reels and 3 or more anywhere will award a free games bonus with 8 to 20 spins. Retriggers are possible and 2 scatters appearing will add 5 extra free games. The enhancement in these free games are the Wild multipliers. When appearing in a win they randomly pay a 2, 3 or 4x multiplier. They are cumulative so if all 3 appear it is possible to have a 64x multiplier on 4 or 5-of-a-kind wins.